An ongoing cycle of life . . . contracting and expanding . . . continues to unfold in the gardens, fields and forest here at Flower Hill Farm. Flower buds swell . . . casting off their protective outer calyxes, just as nestlings grow . . . filling fledgling forms and seeing an exciting and dangerous world beyond the carefully woven nests of their parents. Precious and fleeting life . 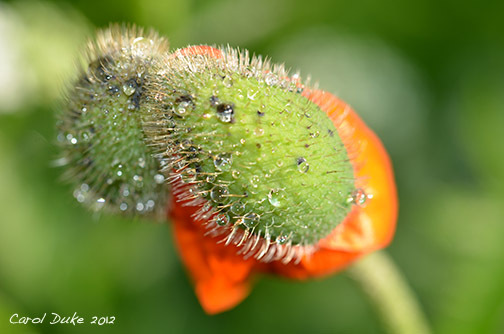 . . not so unlike these tiny droplets . . . clinging to what they are attached to. Outer casings give . . . along finely, engraved cracks . . . yielding to a swollen force of will. 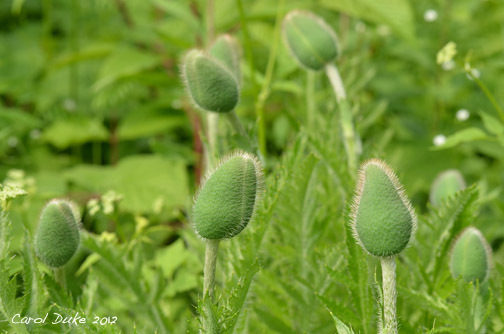 A poppy plants burgeoning blossom no longer can exist within the confines of contraction . . . expanding from within . . . out towards light and fulfillment of life. Paper-like petals neatly folded opening to first shafts of sunlight. Warm sunrays will iron wrinkled flower leaves smooth. Luscious reddish-yellows glow . . . a corolla afire opens to reveal contractions deeper within. Spider-like landing pads lure needed pollinators. Spreading wings . . . free to fly into compliments of green. 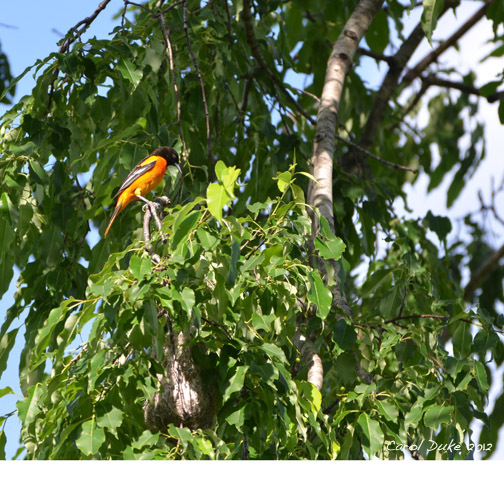 The only other orange in the gardens right now are the beloved Baltimore Orioles. A protective father perches just over his nestlings. 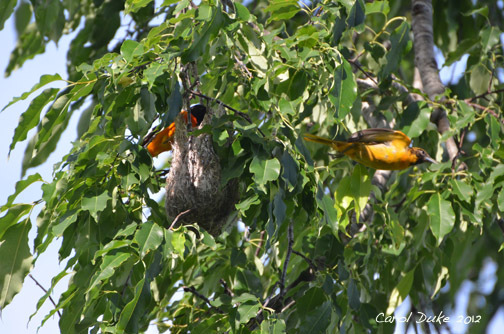 Partnership in parenting is helpful to the female and nestlings alike. The male stands guard while the female forages for food. One little caterpillar, who will never expand into mosaic wings, is about to become part Baltimore Oriole. I believe the former nestlings have become fledglings . . . here the mother is searching for her young. Papa looks on as his progeny expand into their own. Now the remarkably woven nest is empty . 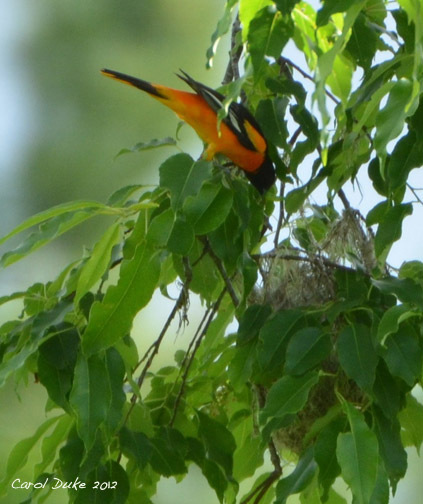 . . the male Baltimore Oriole has more time for preening. I can see the nest, from where I sit writing, and do miss the comings and goings of the parents, as well as the chirping sounds of the young. I still see the father . . . somehow, he seems lost as he flies about the branches and calls out for his mate, when he is not preening that is. Yesterday I watched and photographed him fluffing his feathers for over fifteen minutes. I do hope he is not bothered by lice. The lovely tonal trills the male sings out are not as numerous now. I have not seen or heard the calls of the female this morning and do hope all is well with her and the little fledglings. Flowers bloom and fade and I do regret the absence of their fragrance and ephemeral beauty. I find I feel a larger loss with the flight of fledglings, while, of course, I am elated that new life comes into being and flourishes within the gardens and land I steward. This year I am given the rare joy of seeing a bluebird fledgling grow day by day. While her mother sits on new eggs within the nest box I cleaned, the fledgling waits patiently nearby. I can see her foraging on her own too. It is amazing how quickly birds become self-sufficient. The father bluebird spends time with his immature offspring and is attentive to his mate . . . bringing her bits of food to sustain her during the gestation of their new brood. They are a devoted family. 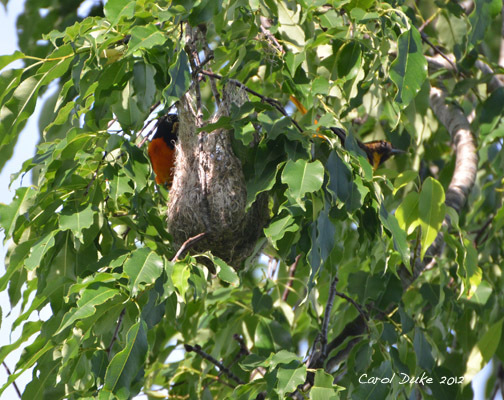 I think I just saw a flash of female Baltimore Oriole. I shall go out and explore and give you an update soon. The father’s presence near the nest gives me reason to think the female and fledglings are nearby. Wishing a Happy Father’s Day to all Papas . . . especially to L & J.